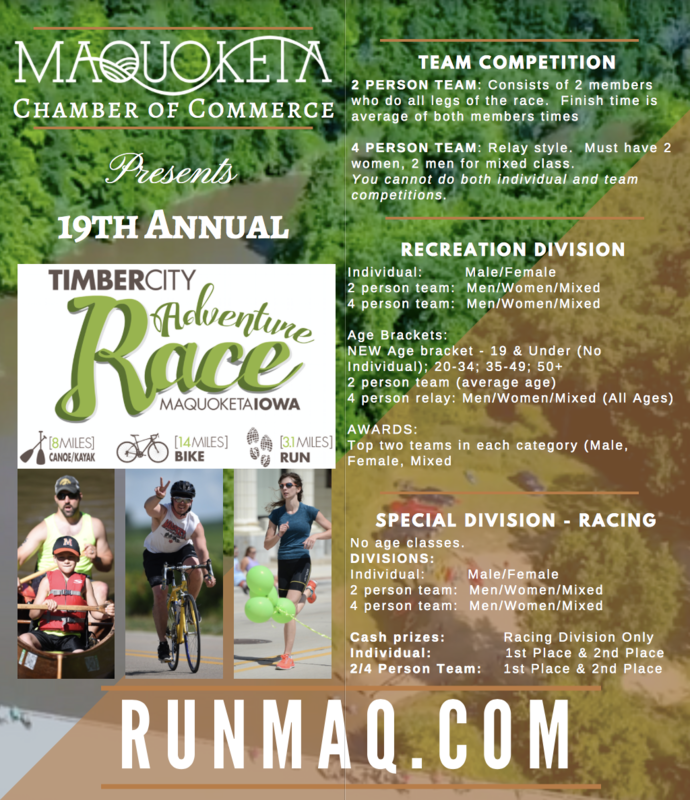 HUSCO International is our Honorary 2018 Timber City Adventure Race Sponsor! Just you and the elements tackling all legs of the race! 2 PERSON TEAM: Consists of 2 members who do all legs of the race. Finish time is average of both members times. 2 Men, 2 Women, or Mixed. 4 PERSON TEAM: Relay style. All men, All women, or must have 2 women, 2 men for mixed class. You cannot do both individual and team competitions. **NEW** For the safety of our race participants, if you have family and friends offering race support, please advise them to stay OFF the race route with vehicles. Please take Baldwin back to Maquoketa and refrain from driving on the bike/run route. Thank you! 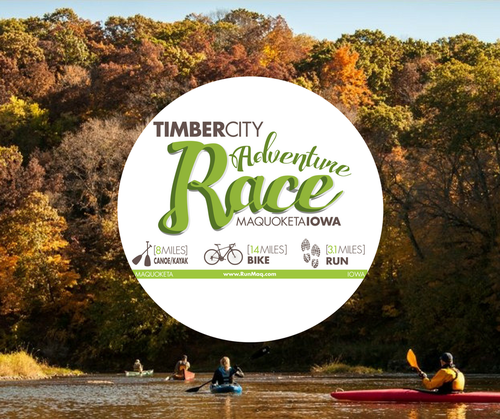 CLICK HERE to view printable photos from the 2017 Timber City Adventure Race! Registration opens at 7 AM at Canton Canoe Access across from the HOP. Race starts at 7:30 AM. The Hop at Canton located at 14966 4th Ave, Monmouth, IA 52309. Recreation class starts first. Race ends on Main Street in front of the Chamber Office, located at 124 S. Main Street, Maquoketa, IA 52060. You must provide your own equipment (bike, helmets, paddles [double bladed are allowed], life jackets, canoe, etc.) 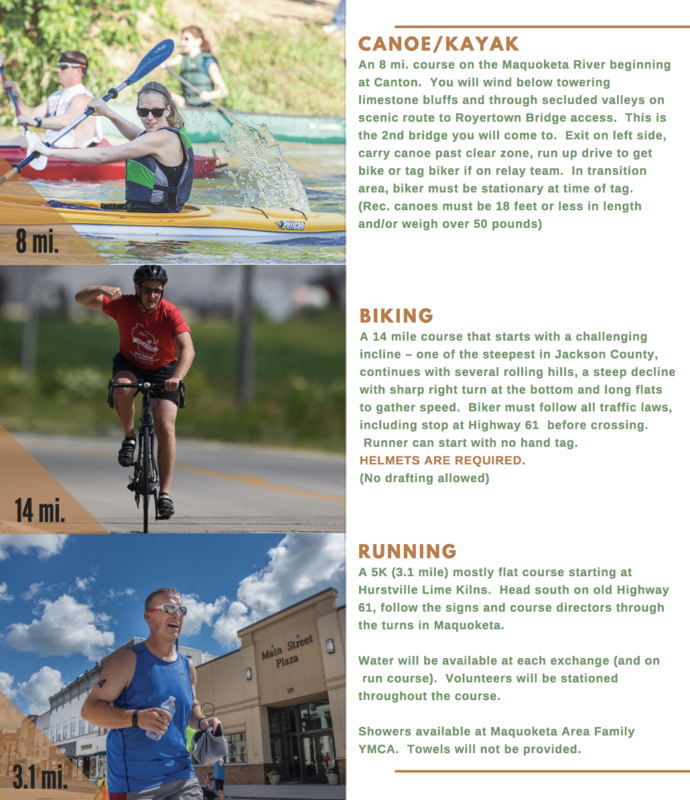 If canoe/kayak, life jacket and paddles are needed, for an extra $35 Maquoketa River Rentals will provide them including drop off & pick up. Register online ASAP as canoe rental is limited. Transportation provided back to vehicle after finish. REGISTRATIONS PRIOR TO JUNE 9TH WILL RECEIVE A $5 PER PERSON DISCOUNT! FREE T-SHIRT IF REGISTERED BY JUNE 9th!